How to Integrate fullPage.js with Divi Page builder? If you ever want to create fullpage designs using Divi, then there are couple of ways – you can either you use Divi’s dot navigation and fullwidth sections or integrate fullPage.js with Divi. Well, this tutorial will explain how to integrate fullPage.js with Divi builder. But why fullpage.js? Because fullpage allows you to create both horizontal and vertical scrolling websites. Also, it supports almost all modern browsers and even the older browsers such as IE6. More importanly, fullpage supports loads of extensions such as Parallax, animation effects, Drag and move etc…So integrating fullpage.js with Divi will allow you to exploit the power of both the fullpage.js and Divi. So, how are we going to do that? Here’s our approach. Why Child theme? Because we don’t want to touch the actual Divi theme, instead we will create child theme and do all necessary customizations there. Step 1: In order to create a Child theme for Divi, you need to have Divi theme installed and activated. Step 2: Create a directory called “divi-child” under wp-content/themes/. You should create child theme under wp-content/themes and not inside Divi theme. Step 3: Create style.css inside the child theme. The "Template" parameter should point to parent Divi theme. Step 4: Create functions.php file inside Divi child theme. The functions.php will let you enqueue parent theme’s style.css. Copy and paste the below code in functions.php file. The missing PHP closing tag was intentional. It’s a best practice to not use PHP closing tag to ensure PHP codes are not getting cut off by a misplaced closing tag. Step 5: Create thumbnail for the child theme. Well, it’s optional. You may create an image of 1200px wide and 900px height and save it as screenshot.png inside the child theme folder. Step 6: That’s it. Go to Appearance > Themes and activate the Divi Child theme. Now we have Divi child theme created, let’s us download fullPage.js files. Step 1: Go to fullPage.js and download the library. Step 3: Lookout for a folder called dist under the extracted folder. Step 4: Create a sub directory called "fullpage" inside the Divi child theme. Step 5: Copy all the files under fullPage.js-master/dist/ into the fullpage sub-folder created inside the Divi child theme. We have installed fullpage.js library into the Divi Child theme. Let’s us now create a custom page template. To do that, we will use the Divi’s standard page template and edit it to create a new page template. Step 1: Copy the Divi’s standard page template (page.php) into the Divi child theme. Step 4: Lookout for the first line – that’s PHP opening tag (<?php) and insert the below line after that. And insert the below line after that. And insert the below line just above that. So basically we have created a nested div "fullpage" inside "entry-content" div. Copy and paste the below code in functions.php inside Divi child theme. Step 5: Let’s add some styles to style.css file inside Divi child theme. To do that, we need to borrow CSS code (which includes some fixes to address problems in certain browsers) from TRG Web Designs. You might want to adjust the padding set for header and footer to match your theme. Step 1: Go to Pages > Add New and create a new page. 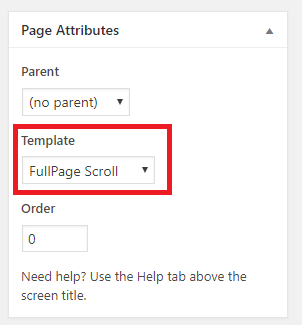 Step 2: Remember to choose the template "FullPage Scroll" from the "Page Attributes" meta box located on the right side of the WP editor. Step 3: Add Divi Sections and assign "section" as CSS Class. To do that, click on the module settings icon > Advanced and add "section" in CSS Class field. Step 4: Publish the page and view the page to see each section taking up full page and scroll the mouse wheel to jump to the next section. That’s it! You have successfully integrated fullPage.js with Divi page builder. Cool isn’t? Let me know your comments. Wait! Divi animations are not working after integrating fullPage.js. I tried to fix the issue, but couldn’t. If someone knows the answer, please let me know in the comment section. Well, that’s the reason I have to use Divi’s default dot navigation and full width sections, but the limitation is – you cannot have horizontal dot navigation. Everything works perfectly, but the full page sections do not ‘jump’ to the next section upon a mouse scroll. Any thoughts on what may need tweaked?